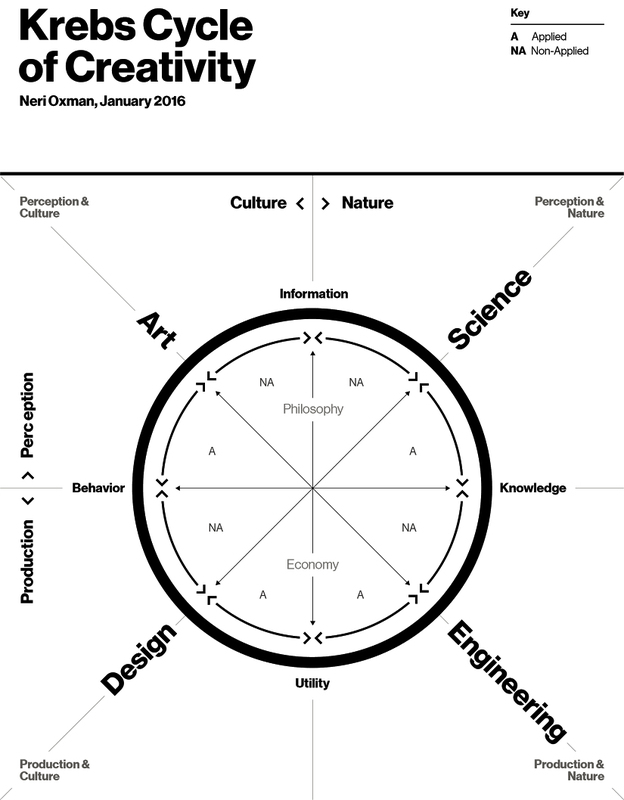 Pictured above, the Krebs Cycle of Creativity, just to toss another conceptual carving into the mix. My post from earlier this week, “Art as the Antithesis of Design,” received a fair amount of pushback. Eli Schiff: You reduce design and art into caricatures in the latest essay. Suspended Reason: I might agree, but can you expand so I have a foothold to respond from? Eli Schiff: Art is not transgression. Modern art is. Design isn’t the antithesis of transgression nor of art. Suspended Reason: I felt I wasn’t so much arguing what art was as noting that people use two different definitions, and playing out what the “art-as-subversion” usage looks like. What did you think of Noë’s definition of design through doorknobs? I’m sympathetic to this: it’s useful to maintain a degree of conceptual continuity in terms, if only so we can meaningfully understand (post)modern and pre-modern art practices as being part of some larger, uniting category, with a shared set of features running through them. Ideally, we would have two distinct terms for art-as-subversion (or structural interrogation, or cognitive remodeling) and art-as-design… Perhaps we would call these “art” versus “pop,” or capital-A “Art” versus lowercase “art” — but we don’t, so the uses get conflated and used interchangeably, leading to communication breakdowns... Thinkers like Nöe, meanwhile, end up — are forced into, arguably — scrabbling over boundaries and definitions. In a semi-private conversation, John Nerst also objected to the “art-as-subversion” model, and on similar grounds: as ahistorical but also in conflict with the understandings of art advanced by thinkers like Christopher Alexander or Juergen Schmidhuber, ostensibly referenced because I’ve cited them in the past. John is right about Alexander, but in my view mistaken regarding Schmidhuber, and I blame my own lack of clarity when defining “subversion” (or perhaps in even using the phrase “art-as-subversion” at all). John lists a few characteristics he associates with “art-as-subversion” — the cultivation of disorder, ugliness, deconstruction — these all being tropes of a particular avant-garde, modernist or post-modernist style of art-making in the 20th and 21st centuries. My impression is that many who read “Art as the Antithesis of Design” came away with a similar interpretation: that I was using “art” as synonymous (and therefore limited) to the (post)modern avant-garde. None of these, with the exception of Endgame and perhaps Mulholland Drive, are works which align with the (post)modern avant-garde’s object-level values. Punch-Drunk Love is slick and beautiful, highly polished if tonally off-kilter. But what it does do is leverage audiences’ existing mental models of film genres and tropes in order to transcend mere beauty and become actively cognitively stimulating. Ultimately, “subversiveness” is not about being difficult for difficulty’s sake, or rejecting Apollonian beauty in favor of ugliness and disorder. It’s about, quite literally, transcending the merely aesthetically affecting and becoming interesting (in the information-theoretic sense) in the service of cognitive remodeling. This, it so happens, is a conception of art largely compatible with Schmidhuber’s compressive theories. Art that is very old—or from a remote culture—sometimes no longer shows up for us as challenging and difficult. This may be because it falls under the category “important art” and is brought to our attention under glass in the art archives. Or it may be that the work is unfamiliar and we don’t get what it is doing. In both cases, the works don’t engage, challenge, or affect us, which is just to say they don’t show up for us as art. What I mean when I say that “art” is often defined by its subversiveness, by its ability to cognitively remodel, what I mean is that it makes a move, predicated upon and leveraging an audience’s knowledge base and cultural context, to create novelty, to add to or challenge an existing discourse (be it a formal discourse, an interplay between aesthetic signifiers, or a more literal discourse on topics like philosophy, psychology, or sociology). If a character in a book or film alters your overall understanding of human nature, we can say your original gestalt understanding of humanity has been subverted and remodeled. Design efforts which extend into actively challenging the existing aesthetic discourse I believe Noë would consider a subgenre of art: that is, they are efforts which attempt to either reorganize existing design practices, or else remodel our cognitive associations between aesthetic signifiers. In explanation, let us mobilize Shaw and turn a turn of phrase. If, The reasonable man adapts himself to the world; the unreasonable one persists in trying to adapt the world to himself. Therefore all progress depends on the unreasonable man, so too can we understand art. Only literature which imposes itself on the reader can effect transformation either personal or cultural, and thus those who look to the arts for more than leisure and pastime must seek out only unreasonable works. It is readily apparent why this would be true in matters of content and subject: works which are perfectly agreeable ethically and philosophically, which do not confront and therefore require the reconciliation of the reader, cannot transform — can only reaffirm consensus. Where design is reasonable, art is ultimately unreasonable, and it is the unreasonable in a work which takes it from design into art.